We all love something to help us cool down in this warm weather, and it’s easy to grab the first ice cream you come across. 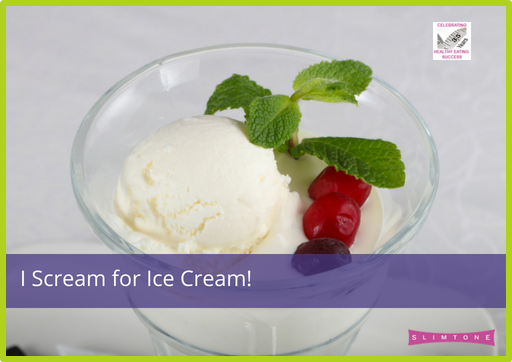 Ice cream can pack a big punch in terms of calories, fat and sugar, but there are some good choices you can make with lots of new low calorie alternatives available. Of course, indulging in a Magnum is no problem – simply go for a brisk walk for an hour, skip for 25 minutes or try cycling for 35 minutes. Alternatively you can go for one of the low calories options here and know that you cool indulgence is a little more “Slimtone-friendly”! Frozen yogurts are a great way to have an ice cream treat. Divide a low fat yogurt between 6 shot glasses and pop in a cocktail stick. Pop in the freezer until frozen and enjoy! The mint one with chocolate sprinkles is like having mint choc chip ice cream but only 15 calories each! And the new Muller Light coconut or the Lidl papaya and coconut would be really tasty and refreshing too. Another great idea is to enjoy a homemade banana ice cream. Chop up one ripe banana, place in an airtight container and freeze overnight. Whizz it up in a food processor or blender until smooth (pulsing on high and then low is the best way to get a really smooth consistency.) Then freeze for another 2 hours and hey presto, a delicious low calorie dessert AND one of your 5-a-day! Why not try the same with mango or blueberries or watermelon – just 2 cups of chopped up fruit will result in a refreshing fruit sorbet. No cream, no added sugar, just heavenly! Instead of a traditional ice cream, try an Eton Mess. At approximately 100 calories per serving, here’s how to make this delicious dessert just for one. Place 6 strawberries in a dish and microwave on high for two minutes. Mash half of the strawberries and pop into a stemmed wine glass. Crumble a meringue nest and sprinkle half over the strawberries. Add two scoops of Walls Light ice cream and the remainder of the strawberries. Top with a squirt of aerosol cream and the rest of the crushed meringue nest. Decorate with a sliced strawberry and enjoy! So enjoy this lovely weather, make the right choices and you can stay cool and lose weight!